Sea buckthorn, also known as Siberian pineapple, sea berry, sandthorn, or swallowthorn, is a deciduous shrub that grows natively across northern Eurasia. As its name suggests, sea buckthorn’s branches are dense, stiff, and thorny, but its berries can provide nutrition for both people and wildlife. 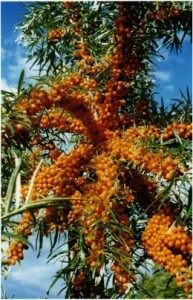 Sea buckthorn is valued in parts of Europe and Asia for its nutritional and medicinal properties. Its bright orange berries are high in carotenoids, flavonoids, and vitamins A, C, E, and K; in fact, the concentration of vitamin C in sea buckthorn is higher than in strawberries, kiwis, oranges, tomatoes, and carrots. The berries have a fruity yet sour flavor and are often used in juices, jams, sauces, and liqueurs. The silver-gray leaves yield a tea rich in antioxidants, and the plants are even high in essential fatty acids. While sea buckthorn is currently used medicinally in Russia and China, it has only recently attracted the attention of researchers across the world. Sea buckthorn oil, which can be extracted from seeds, is said to be anti-inflammatory, antimicrobial, and adaptogenic (helping the body develop resistance to stressors). It is used as a treatment for mucositis, ulcers, radiation damage, burns, and scalds, as well as to relieve pain and promote tissue regeneration. While clinical studies are still needed to fully understand its medicinal benefits, a study by Hamdard University in India shows that sea buckthorn may help protect against diabetes. Beyond its human health benefits, sea buckthorn also boosts the health of the environment in which it grows. Because its extensive root system can bind together even sandy soils, sea buckthorn prevents water and wind erosion on slopes and in open areas. It is fairly drought and frost resistant, tolerates soil salinity and low temperatures, and can withstand a range of soil pH levels. Sea buckthorn also adds nitrogen to the soil through nitrogen fixation, so it can grow in marginal soils and help restore them. 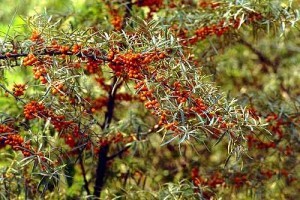 Sea buckthorn provides food and shelter for a variety of animals. In the Loess Plateau of northern China,51 species of birds are entirely dependent on the shrub for food. Despite the relative ease of cultivation, sea buckthorn is difficult to harvest, and machines to efficiently collect the fresh berries are still being developed. Harvesting berries by hand is time consuming (some estimate 600 person-hours per acre, compared to the 120 person-hours per acre required for tomatoes). Until harvesting machines become readily available, large-scale cultivation of sea buckthorn may not be viable. Given the many potential benefits offered by sea buckthorn, groups such as the European Commission’sEAN-Seabuck network have prioritized the development of economical and sustainable production methods for this plant. In the meantime, sea buckthorn retains its ability to improve environmental and human health on a smaller scale. Carol Dreibelbis is a former research intern with the Worldwatch Institute’s Food and Agriculture Program. ← Sea Buckthorn Skincare Products – What Should You Look For?